For centuries, Native Americans from Boise to Wenatchee to the southern Oregon coast have harvested Pacific lamprey, colloquially called eels. The ugly-looking critter resembles an eel, but it is actually a primitive fish with a distinctive, toothy suction cup mouth. 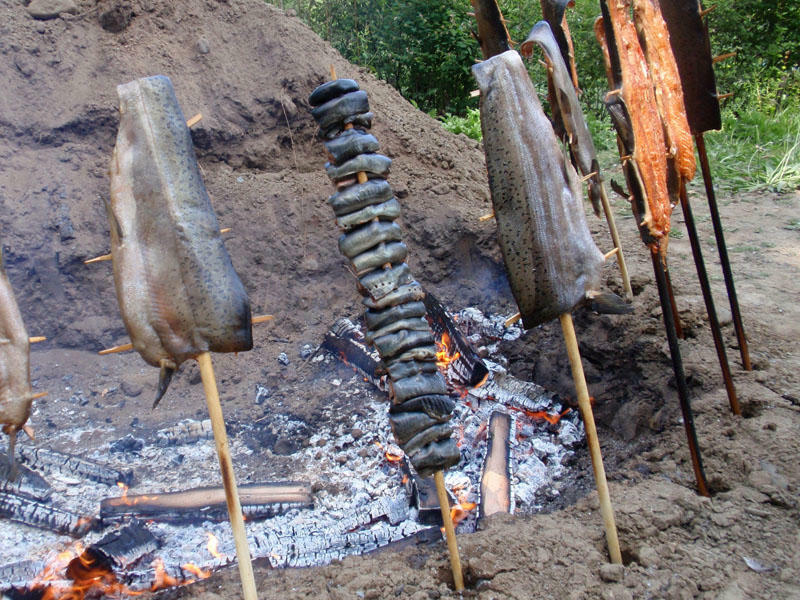 Lamprey pieces (center) sizzle between salmon in a traditional preparation, which was served to attendees at the "blessing ceremony." Willamette Falls, just outside Portland, is one of the few remaining places in the Northwest where it is possible -- and legal -- to catch Pacific lamprey for personal and ceremonial use. Tribal members are about the only ones who go for it. During a "blessing ceremony" for lamprey and fishermen held at the confluence of the Willamette and Clackamas Rivers Monday, tribal schoolchildren led an eel dance, a sort of snaking Conga line more than 50 strong of all ages. One of the fishermen there, Patrick Luke, is a Yakama Nation biologist. Luke is still miffed about the ticket he received from Oregon Fish and Wildlife police at the nearby falls in 2011. "Now they have got folks on the reservation that won't even come down here because they are afraid that enforcement will intimidate folks like they did in the past," Luke said. "I grew up living that way in the 1970s seeing the state policemen treat the Indian folks really bad." Three years later, the Yakama Nation is still fighting Luke's ticket. Two other fishermen were also cited and had their catches seized that day for fishing without a state permit. The thing is, Oregon does not "co-manage" lamprey the same as salmon or game. 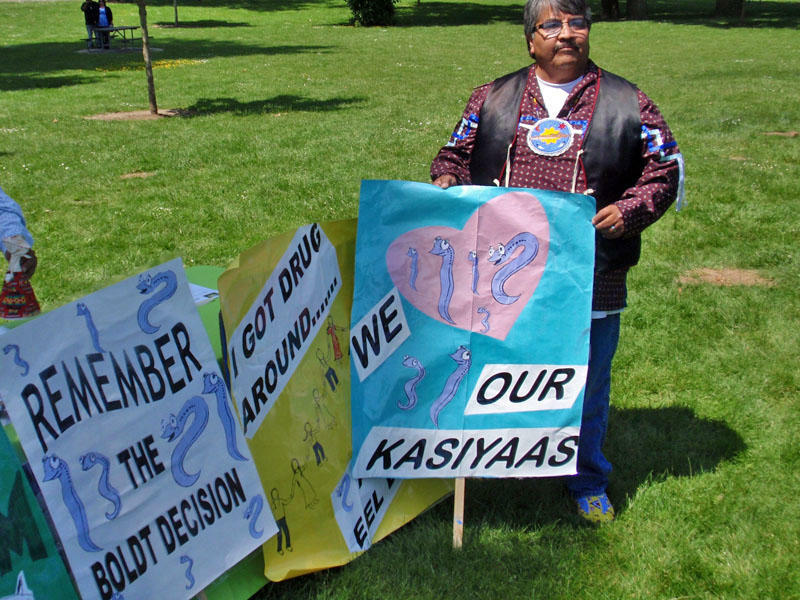 Yakama Nation biologist Patrick Luke with posters made by tribal school students for the blessing ceremony. "It is not a treaty right," State Police Captain Jeff Samuels explained. "It is definitely open to all," with everyone under the same rules, he said of the state's approach. From the tribal point of view, they believe they shouldn't need the state's permission. "They don't set our seasons," Luke said. "We have our own law enforcement that sets our own seasons." At Oregon's Department of Fish and Wildlife, fishery managers are trying to finesse the issue so it doesn't escalate. The department's Tony Nigro said his agency is trying to reach an understanding that at least clarifies the rules. "The state has its policies and its legal positions," Nigro said. "They aren't necessarily in agreement (with tribal positions) at this point in time. But we respect and recognize the differences. I think we've been fairly good at putting those differences aside, seeing if we can work cooperatively." 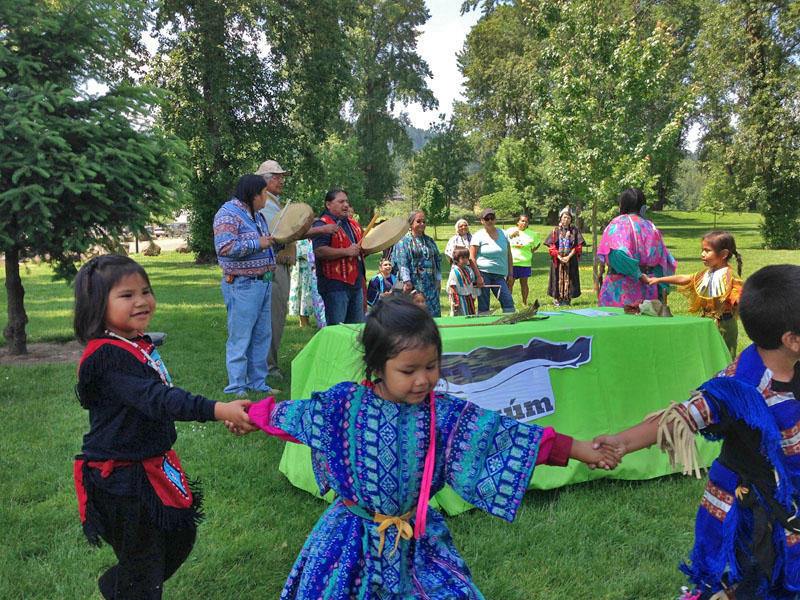 Children and tribal elders alike danced the eel dance at Clackamette Park on Monday. Nigro said Northwest states, tribes and the federal government have a common goal to keep Pacific lamprey off the endangered list. Populations of the migratory fish have declined dramatically in recent decades. The reasons are many including dams and water diversions. Lamprey have trouble swimming up fish ladders designed for salmon. However, both sides see room for a limited ceremonial and subsistence harvest within a larger recovery effort. Evaline Patt, a Warm Springs tribal council member, said lamprey used to be a staple in the diets of Columbia and Snake River basin tribes. "It's a rare treat now," she said, "It's getting to be a delicacy." Patt compared lamprey to oysters. Others said it tastes like fishy steelhead. Clean Slate For Tribal Fishing Rights Protesters? Around 40 to 50 years ago, American Indians in Western Washington were repeatedly arrested during protests over treaty fishing rights.